To make the SmiLe community even more business savvy, we ask you to share your knowledge about resources that make you smarter. Let us know about any events or opportunities that you would like to share with the community! VINNOVA: Industrial pilot program for the use of neutron and photon based techniques at big scale research infrastructure – spring 2019. From pipette tips to paper towel and enzyme kits to microscopes – come and meet 20+ suppliers of lab ware and instruments. April 25, 13.00-16:00, SmiLe community space. MultiPark Innovation Day Lecture: “Molecular tools and business opportunities”. Date: 9 April, 9:00- 12:30. VINNOVA: Digital Aids / accessibility. Vinnova supports the development of innovative digital aids to improve accessibility for all. Apply for Sten K Johnson Foundation grant! Application period: 14th of January until February 14th 2019. For more information, deadlines and application read more. Collaborative projects for better health by Swelife, closing February 28th. Smile members get a 50% discount! Contact Lina for more information. When: Wednesday February 13, 08:30 – 09:30, breakfast available from 08:00. Innovation for Health – Conference – External Event. Place: WTC Rotterdam, The Netherlands. Saurabh Mishra is the founder and managing partner at Farmantra S.L. His areas of expertise include corporate finance, biotech valuation and macroeconomic analysis. Jan 14th - Feb 14th / Apply for Sten K Johnson Foundation grant. Vinnova: Protein research and process development for biologics – smaller projects. Vinnova: Protein research and process development for biologics – larger projects. Application Deadline: January 15th, 2019. All early and mid-stage medical device, diagnostic, and digital health companies are encouraged to apply. Companies do not have to relocate, and there is no equity required for participation. Benefits of the program include: high profile visibility to healthcare investors and decision makers, access to a best-in-class network of mentors and peers, and participation in a customized virtual curriculum. Startups will be selected based on strategic interest to present at events throughout North America, Europe, and Asia. Accelerator companies will have the opportunity to be mentored by our corporate partners such as Baxter, BTG, Fujikura, HOYA, Johnson & Johnson, Olympus, NIPRO, W.L. Gore, RCT Ventures and many other industry leaders. And on top of that, there’s a chance to compete for up to $500,000 in non-dilutive cash prizes and in-kind awards! Startups interested in applying for the 2019 program will have until Friday, January 25, 2019 to submit an application. Early entry is recommended for priority reviews. Sign up via the RSVP link you received by mail. Place: The Swedish Embassy, Copenhagen. Date: 30 January, 2019 / 2 Days. New Call – Collaborative projects for better health by Swelife. Apply for up to 3 million. Opening 17th of December 2018, closing February 28th 2019. Come to the information meeting at Inspira, Medicon Village on January 21st, 14:00-16:00! IM12 call 14 – Research and Innovation Action – apply latest 18th of December. Medlemsmässa with Entrepreneur Slam och After Work! Life Science Sweden and Kemivärlden Biotech like to invite you to the annual international partnering meeting Pharma Outsourcing at Stockholm Waterfront Congress Centre December 12, that has been organized since 2015. The meeting will be covered by the media and pre-bookable face-to-face meetings are offered for free. Please do note that non-service-providers such as researchers, people in biotech, pharma and virtual companies and VC’s/Investment Managers, register for free. These are the main target audience for the event. ALMI IP-checks to apply for SMEs with 9 employees and 3 annual reports. Deadline 30/11. Di Digital Startup Tour – Is a meeting place for company owners, representatives of venture capital companies among others. BIO-EUROPE SIDE EVENT – MVA MICROBIOME NETWORK MEETING organized by Medicon Valley Alliance, Copenhagen Capacity, and Invest in Skåne. November 8th, 2018, 09.00-13.00, Medicon Valley Alliance, Copenhagen S.
BIO-EUROPE SIDE EVENT – NEUROSCIENCE organized by Medicon Valley Alliance. 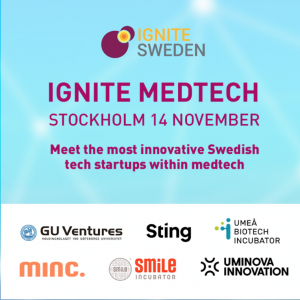 Ignite – a Swedish organization with the aim to support increase commercial collaboration between startups and corporates – organizes a matchmaking event. Some of SmiLe´s incubator companies are joining. Place: Cobis Copenhagen Bio Science Park, Denmark. For Mobile Heights members: Free of charge, Non-members: SEK 1000 + VAT and fees. SmiLe Incubator och SIS (Swedish Standards Institute) bjuder in till seminarium om standarder och standardisering ur ett internationellt perspektiv. Seminariet kommer att fokusera på standarder och standardisering inom medicinteknik, laboratoriemedicin, bioteknologi, hälsoinformatik, och biologisk säkerhet. Small and medium-sized Swedish companies that are applying for financing from the EU programme European Innovation Council (EIC) Pilot can receive support from Swelife to cover costs arising from the application process. Swelife grants a maximum of SEK 100 000 per applicant company. Sign up for inspirational talks, knowledge gaining and social events with the continuously growing HealthTech Nordic community!The 5th community meeting will run in Gothenburg Sweden on October 24 at Sahlgrenska Science Park, Medicinaregatan 8 A and October 25 at Biotech Center Arvid Wallengrens Backe 20. Don´t miss the Life Science Job Fair at Medicon Village! BioStock proudly welcome you to the first ever BioStock Life Science Summit, where innovation and capital connect. Hosted at Medicon Village in Lund, BLSS 2018 is the Nordic region’s premier meeting place for entrepreneurs and investors, offering an exciting sneak peek into the future of biotech, pharma, diagnostics and health devices. Connect in collaboration with SmiLe Incubator and Medeon Science Park conducts a venture capital event with Life Science lecturers and the opportunity to pitch for Connect’s Life Science angels. The day begins with coffee and mingel at 9 followed by introduction, lecture and ten companies that pitch. The event ends with a common lunch buffet. Arvidsson, lärare vid Ekonomihögskolan, LU. EUSME Supportkontoret anordnar en kostnadsfri skrivarverkstad för små- och medelstora företag som är på väg att gå från idé till ansökan. Apply for up to 1–3 million Euro. The application deadline is 4th of September. Companies that seek venture capital during Q4 2018 / Q1 2019 have the opportunity to compete. 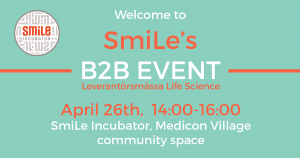 Selection of 5 companies will take place on 2 October at SmiLe by pitching for a jury consisting of representatives from SmiLe, Medeon, Invest In Skåne and Connect. Connect in collaboration with SmiLe Incubator and Medeon Science Park conducts a venture capital event with Life Science lecturers and the opportunity to pitch for Connect’s Life Science angels. The day begins with coffee and mingel at. 9 followed by introduction, lecture and ten companies that pitch. The event ends with a common lunch buffet. Apply for up to 1–4 million Euro. The application deadline is 11th of September. 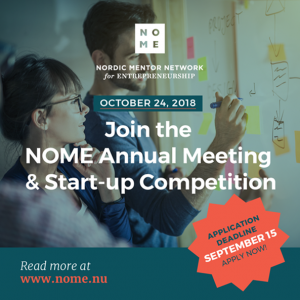 SEP 15th / Apply for NOME’s start-up competition! Apply for NOME’s start-up competition! HealthtechTAB – Call for projects open until Sep 24th! Submit your promising technologies in the health area! The healthtechTAB is a healthtech translation advisory board whose mission is to help build successful business in Europe. This platform offers access to industry knowledge and support in several areas, tailored to the needs of each project. In a simple manner, it consists on a service that offers technical and commercial evaluation together with peer support and guidance. The TAB supports European startups, SMEs and academics, free-of-charge and with no strings attached for all applicants. You may also find detailed information regarding our Process on our website (https://healthtechtab.eu), where you can also submit your application for the 2ndHealthtechTAB-in Sessions in Copenhagen on the 24th of September. The application process is very straightforward and specific, focusing primarily on the technology behind your idea, it’s unique selling proposition and the state of IP and business development. Plocka fram ditt eget DNA på Kulturnatten! 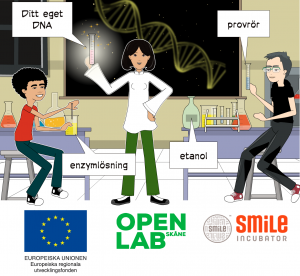 Kom och besök Open lab Skåne & Smile Incubator på Vattenhallen Science Center den 15:e September, så får du delta i en laboration och sedan ta med dig ett hängsmycke med ditt DNA. Breakfast seminar by Innovation Skåne: Frukostseminarium: Den offentliga affären – enklare än du tror! This opportunity is applicable for eHealth companies already within HealthTech Nordic Community or if they register to become members at http://healthtechnordic.com/join-us/. The Investor Forum will coincide with a HealthTech Nordic Community Meeting. On October 24 we will organise a full day investor meeting in Gothenburg, as part of our HealthTech Nordic offering. It’s been created with the aim of establishing relevant contacts between selected start-ups and healthtech investors, establishing fruitful relationships that can lead to funding for growth. It’s a day of intense networking, with a combination of investor and start-up pitches, one-to-one meetings and networking sessions. The participants will also gain insights into the latest trends in the field of healthtech. The Investor Forum is an invite only event providing for focused discussions in smaller group. We will be organising one-to-one speed meetings where startups will get a chance to meet 7-14 investors. Please register your interest in participating as soon as possible but no later than August 31. After application deadline, the HealthTech Nordic steering committee will select the participating 14 companies. Please be sure to respond to your invites and contact laura@smileincubator.life for more information. The conference will highlight SSGG’s previous project activities held in the past 3 years, together with participating companies, project partners, and researchers. Swedlifes EIC pilot Grant – The grant is for Swedish companies in SME Instrument phase and Fast Track Innovation. The application is open until 21st of June. Read more about the event here. Our very own Kristina Masson CEO Acrivon Therapeutics, will be one of the speakers. Contact aisha@smileincubator.life for more information! GDPR Seminar by Setterwalls Law Firm. Right after the SmiLe weekly breakfast, we will have a seminar with a focus on “The General Data Protection Regulation (GDPR), which replaces the current Swedish Data Protection Act on 25 May and affects all businesses”. The seminar will be facilitated by Martin Levinsohn and Marcus Svensson both from Setterwalls Law firm. An opportunity for E-health companies! HealthTech Nordic offer startups that are ready to scale in the US support to do just that, as well as important exposure at the renowned Health 2.0 conference. Price: $1000 per company, plus discounted conference tickets and expenses for travel and accommodation. Additional costs for tailored support after Health 2.0 may be added. 10 startups in total will be selected. Apply for the Accelerator Tech Incubator program 2018 via Vinnova. Please sign up for the event to attend the event, and to help us plan ahead. SmiLe will organize a bio-hacking workshop where you can extract your own DNA! You can participate in doing this, by attending the workshop. En kurs i internationell förhandlingsteknik med fokus på metoder och träning i att föra värdediskussioner och förhandla konstruktivt. Syftet är att varje deltagare ska en skickligare förhandlare. Teori varvas med praktiska övningar, exempel och diskussioner kring deltagarnas egna erfarenheter och frågeställningar. Utbildningsledare är Mats Lidgren från Mats Lidgren AB. Mars är certifierad förhandslingskonsult och har lång utbildning inom förhandlingsutbildning och coachning. Han är också utbildad att ge feedback enligt NVC-metoden (Non Violent Communication). Inbjudan skickas ut separat. Kursen är en del av projektet Southern Sweden Going Global. 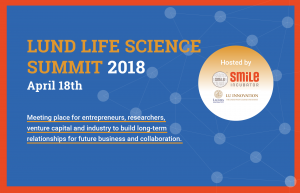 The Lund Life Science Summit hosted by SmiLe and LU Innovation takes place in Lund on April 18th. The Summit aims to connect innovative life science entrepreneurs and companies with pharma industry and venture capital. This exclusive event will bring together selected representatives from Lund Life Science ecosystem to interact with professional stakeholders. The aim is to network, discuss, showcase and share knowledge. The event will consist of panel discussions, speed dating and One-on-One interactions. SmiLe and LU Innovation provide access to the start-up community as well as to cutting-edge academic science projects. The panel consists of three venture capitalists and pharma companies and 8-10 projects/companies. The Summit will also invite 30 external guests. For the fifth year in a row we invite you to interact around research and innovation in the oncology area. How can new ideas be created by working cross borders? How can industry, academia and the healthcare sector work together? We are continuing last year’s successful speed-networking and dialogue forums in order to find new partnerships. This year we also introduce a catwalk pitch for researchers and companies to address new collaboration possibilities. The meeting is a cancer forum for industry, academia and the healthcare sector in the Medicon Valley region. Other interested parties, working on cancer, within Lund University, Region Skåne and Medicon Village are also welcome. The meeting will be held in English. Are you an e-health company? Later this year, Swedish SMEs will get an opportunity to test their product or concept in the Baltic Sea Region, in countries such as Germany, Poland, Estonia and Finland. This will also provide an opportunity to make new connections in these markets. ProVaHealth is a Baltic Sea region project aiming to broadening the testbed network in the Baltic Sea region in order to better support SMEs in the healthcare sector. Innovation Skåne is the project’s Swedish partner. Is your company interested in taking part? To build a testbed network fitted to SMEs the project need to learn about the companies’ needs, experiences and concerns. Innovation Skåne is therefore currently interviewing companies and are looking for companies that want to take part. The interview takes one hour and can be conducted over the phone, via Skype or a personal meeting – whichever suits you the best. The interview is confidential and the information gathered is anonymized and questions follow a structured questionnaire. If you wish to take part, please notify Innovation Skåne’s Fred Kjellson at fred.kjellson@innovationskane.com as soon as possible. 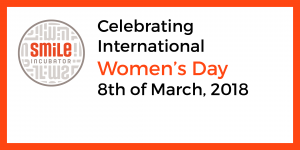 In celebrating this day, SmiLe Incubator will celebrate its first International Women’s Day. The event will celebrate, empower, and support women in Life Science business. We will have female CEO’s, leading and aspiring female entrepreneurs in life science to share their stories. International Women’s day is a time to inspire each other, to call for a change and to reflect on progress made by women in different parts of the world. The idea of this event is to help connect with business owners, learn tricks and tactics that can be useful to build a successful business. This event is for anyone with the desire to start a business, working in life science, wants to be inspired, empowered or celebrated. Have your most challenging struggles and questions addressed by female experts in the field of life science. There will be food and a light refreshment! Tailor-made and case based workshops with individual coaching on price strategies and business models. The trainer is Lotte Kylberg from Monday Morning who has extensive experience from strategic pricing and business development and training within the field. The workshop is on invitation only. 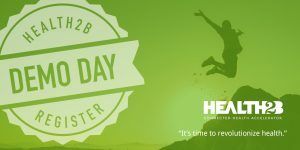 Come and join us for Health2B Demo Day! Seven awesome startups will present their new solutions for improved healthcare to the world. Also, a lecture by Henrik Ahlén (eHealth strategist) on “The Digital Transformation of Health Care”. Who are the seven startups? OPEN LOGGER – Safe sensor systems for critical processes in laboratories and hospitals. WIRELESS HEALTH – Portable ECG with clinically practical, advanced cloud analytics. MEDOTEMIC – System for objective gait deviation analysis and treatment. POOW – Imagine… A super hero that helps your child that have a hard time eating to eat ! ACTIVE MAMA – Keep moving with a pelvic support belt and active pain relief. MAMIO – Mamio is an Artificial Intelligence-based solution that assists in monitoring the medicine intake. M-VITAE – Feel confident through guided management of non-cancerous breast issues. Do you know what factors underpin the value of your biopharma product? January 17th / Imagene-iT presents "Seeing is Believing"
This is an awesome opportunity to affirm oneself to the whole idea of “Seeing is Believing” in relationship to Life Science. CEO Imagene- iT Anders Brinte will give a presentation and also show a short video about this model. Imagene-iT is a member of SmiLe Incubator community, working as an independent professional science consultant company. Many are probably wondering who is the newest member of SmiLe Health2B Accelerator program. Well, we have the answer for you. Next week Wednesday we have decided to invite the entire team to our usual breakfast. The team will discuss their current projects and hopefully network with SmiLe community member for a future possibility to expand their ideas into reputable businesses. 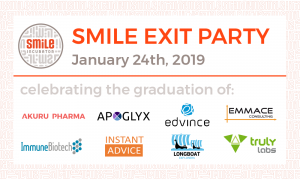 SmiLe celebrates 10 years of incubation – Welcome to our party mingle!! Join us to celebrate and to meet interesting people. You may see smashing performances on stage, hear true stories behind successes, get tips from the coaches and mingle with our guests: entrepreneurs, scientists, decision makers, investors and others. The event is free, but registration is needed. Register here! Welcome to an information seminar on 7 December about Sweden’s new test bed for the production of biological products. Do you have technology that could improve the future’s bio-pharmaceutical production, or are you interested in producing biological products? Then you are warmly welcome at an information seminar about the new Bioprocess Innovation Center, currently being built at GE’s site in Uppsala. The center is scheduled to open after the summer of 2018, and currently projects that are interested in using the center are being recruited. Date: December 7th. mingel and coffee at. 10.00, ends at 11.30. Are you an entrepreneur with an idea? Are you looking for funding opportunities? Do you have an idea within Medicine and Entrepreneurship or related discipline? We got you! Sten K Johnson Foundation will open soon for grants application from January 15th to February 15th 2018. Welcome to The Scheele Symposium on Targeted Cancer Treatment in honor of the 2017 Scheele Award Laureate Professor Charles L. Sawyers. Appinmed and Next Step Dynamics previously from SmiLe Incubators, E-Health accelerator program Health2B are among the seven startup companies participating in the event. Welcome to MedInnovation Skåne – a new meeting place for discussion on how innovation and research close to the patient can create future healthcare. Join us for a SmiLe community mingle and some drinks! Seminar: The Ice Cream Way. Trends, design and product development. A creative seminar with short theories, with examples from different industries and the chance to talk to many entrepreneurs! A developed and active Board may, when used correctly, can be a tremendous asset to your business. It can provide new perspectives on your business, the management team’s work and much more. The Board’s focus and composition should look different depending on which phase the company is in, and the aspirations for the near future. But how do you get the board to lead your business business as successfully as possible? This training is designed for early-stage companies who face the question of whether to start using a board or not. Price: 12.000 kr exkl. moms. Bring a colleague for 8.000 kr. 8-week program, starts Oct 2, fee 40 kSEK (whereof 50% is sponsored by BI2020). What you can apply for: Projects that use AI to develop solutions with a great potential to improve public health, care or care in Sweden. Who can apply: Constellations of at least two project partners with different expertise – artificial intelligence and health or care. Applicants from all sectors are welcome. At least one needs-owner must be included as a project partner. For how much you can apply for: The budget for the announcement is SEK 20 million. Project times may be up to three years. What you can apply for: Collaboration projects that include medical technology. It may be about using existing technology in a new way, or developing new technologies that can radically improve the clinical outcome or increase the efficiency of care and care. Who can apply: At least two different actors must cooperate, and at least one of the parties must be a company. Other parties may be universities, colleges, health care organizations, research institutes or other relevant actors. For how much you can apply for: The funding can cover up to 50% of the total budget of the project. For the announcement, SEK 16 million is allocated, which will be spread over 10-15 projects over two years. The EU-Japan Centre is inviting applications from EU companies to host Japanese trainees for 8 months (August 2018-March 2019). The trainees come from leading Japanese universities and are students in engineering, biology, chemistry, or other scientific/high-tech fields. They will be able to communicate in your company’s local EU language. EU Company’s advantages: a valuable addition to the R&D workforce and an insight into the Japanese culture, extremely useful for successful business with Japan. The conference creates a space for meaningful encounters, with one-on-one meetings being one of the main features of NLSDays. Additionally, the high quality of topics and presenters provide insight into the most recent trends in science and business. NLSDays attracts leading decision makers from biotech, pharma and medtech as well as finance, research, policy and regulatory authorities. innovators and startup companies emerging from the Nordic Life Science Incubator ecosystem. Materials Business Center, together with Open Lab Skåne, welcome you and your colleagues to an Innovation Summit on Drug Delivery. This is an opportunity for representatives from established industry, academia and entrepreneurs to get together and share insights and results, triggering new ideas, collaborations and businesses, within the field of Drug Delivery. New methods for ensuring that pharmaceutical substances safely achieve their desired effects requires new approaches and collaborations. Southern Sweden, a stronghold within nano-technology and life science combined with a vibrant ecosystem of pharma companies, has the right conditions for becoming a world leader in the area of Drug Delivery. In May 2018, the rules regarding the handling of personal data will change significantly. The new rules make absolutely new demands and companies need to start preparing for it now. What does the new legislation mean about managing personal data for your company? Join a delegation trip to Sherbrooke Innopole, Canada. The Sherbrooke Research Center on Aging focuses on falls, pain, domotic, robotics, sleep, driving, etc. Travel expenses will be sponsored. The Women’s Startup Lab has opened applications for their Silicon Valley Immersion Program, a two-week acceleration program that starts on September 17. On Tuesday Aug 22nd our new partner PULS visits SmiLe. Take the opportunity to meet some of PULS´ own partners, about 40 people from the research community and the medical device and pharmaceutical industries! Their unique knowledge is something SmiLe´s companies now have access to, as PULS representatives will be visiting SmiLe on regular basis. INSPIRATION, KNOWLEDGE, NETWORKING – AND ACTION! Welcome to a two-day summit, focusing on Good Health & Well-being and Sustainable Cities & Communities. The themes are picked from The United Nations Sustainable Development Goals. Meet world leading scientists, ground breaking entrepreneurs, influential opinion makers and some of the best regarded thought leaders. Get inspiration, valuable contacts, knowledge and business opportunities. SmiLe has received the opportunity to purchase 10 tickets for a discounted price (100 EUR) for the conference The Bridge on 22-23/8. The ticket also gives access to workshops. From a life science perspective, the first day is extra interesting as the focus is on health and prevention, among other things. On cell therapy and diabetes. Further Evy Xintela is presenting. First come. First serve. Contact Lina in order to get your discounted ticket! SmiLe Wednesday Breakfast is back! – Deadline to apply 31 July 2017, 17h30 Tokyo local time. Apply for Skåne’s digitization support. As a small business in Skåne you can apply for support, so-called checks, for digitization. Your company can get a support with the value of between 100 000 och 250 000 SEK in order to digitize your company. The purpose of the checks is to achieve increased competitiveness and renewal in small businesses in Skåne through digitization, for example by changing the company’s business, process or organization. It can be anything from developing a digital strategy linked to the business plan to identify new business models and streamline digital processes and systems. Companies can be granted between 100,000 and 250,000 kronor, ‘first come, first served’ principle applies. During Almedalsveckan you can follow debates directly at Almedalen or online via live stream on dagensmedicin.se and on digital.di.se. Apply for research program for development and production of biologicals. Join us at Health2B Demo Day. Our Demo Day will feature four awesome startups who will present new solutions for improved healthcare to the world through team spirit, passion and purpose. During the mingle, free food and beverages will be served while you have a chance to network with investors, serial entrepreneurs, business leaders and key players in the innovation ecosystem. Join us at Restaurang Inspira, Medicon Village – Lund on June 1st. Doors open at 15:45 and the program starts at 16:10. Register today! We have a limited number of seats. Are you a company in need of lab space and instrumentation? 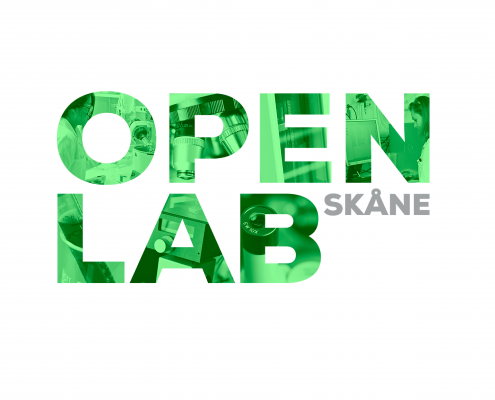 Open Lab Skåne is an opportunity for your company to gain access to lab space, state-of-the-art instrumentation and key competences in the field of life science, chemistry and materials science. We offer custom – made solutions depending on your needs. The event is part of Skåne Innovation Week. Startup Live! is the largest startup event in southern Sweden! Join the event on June 8, 2017 from 17:00-20:00 at Slagthuset in Malmö to meet and learn from other awesome people interested in startups. The event will feature startups from across the region as well as international investors. Startup Live! will showcase people working with Impact investing, e-Commerce, e-Health, CleanTech, Artificial Intelligence, venture capital and more. Stay after the stage event for a drink and mingle. Välkommen till en dag med fokus på affärsutveckling och hållbarhet! Kom och låt dig inspireras av tre fantastiska företagare som berättar om hur de utvecklar sina företag genom att arbeta värderingsstyrt. En av dem är VD för ett företag som förra året fick utmärkelsen “Sveriges mest attraktiva arbetsgivare”. En annan har varit nominerad till utmärkelsen “Årets uppfinnarkvinna”, och den tredje har en fantastisk historia att berätta om Sveriges bästa fotbollslag -och hur de arbetar för att skapa samhällsnytta. Let´s come together to celebrate Summer times! Registration Deadline for event Cancer Collaboration at Medicon Village, Lund. A half day about research and innovation in the oncology area, how industry, academia and the healthcare sector can work together. The arrangement is co-organized by SmiLe. For more information visit Medicon Village website. The mission is organised alongside the “Bio Japan Expo” in Pacifico Yokohama. Unique opportunity for BtoB meetings! In addition to the participation in BioJapan 2017 expo from 11 to 13 October with a common booth, the mission participants will be able to attend the European Biotech & Pharma Partnering Event at Senri-Life Science Foundation that will take place in Osaka. Pre-arranged B-2-B meetings with companies from Kansai regions will be organised in collaboration with Osaka Bio Headquarters on Tuesday, 10 October 2017. – Bioinformatics and Bio imaging etc. -> EU Biotech SMEs with an expertise in e-healthcare, wearable for healthy aging to help improve the quality of life of the Silver Society. -> EU Biotech SMEs which are interested in investing or co-investing in Japan for collaborative R&D or Joint Venture with JP partners. Medtech Bridge match making. A whole day event at Medicon Village, Lund. For more information and registration visit Medtech Bridging Event. Morning seminar about how Medtech companies can use 3D printing technology, by professor Olaf Diegel. Breakfast from 8.00 am. Please register no later than 26 April. For more information and registration visit website. Invitation of Sedermera to join the event Börs- och kapitaldag at Malmö Live. Sedermera offers free participation to the event including a seminar and breakfast. For more information and registration visit Medicon Village website. Date: May 17 from 14.30-19.00 at Elite Hotel Ideon, Scheelevägen 27 in Lund. Register to participate no later than May 2nd. Skåne Innovation Week 2017 is taking place for the fourth time, and it is Region Skåne that is behind the arrangement. However, the activities taking place during Skåne Innovation Week are all arranged by different actors in different parts of Skåne. It may be business incubators, local authorities, clusters, companies, associations or entrepreneurs, who are behind what is happening during the week. What they all have in common is that they are, in some way, working for a more innovative Skåne. Under Skåne Innovation Week bjuder Connect in till ett högaktuellt frukostseminarium under ledning av EY. Hur rustar man sitt företag för framtida tillväxt? Karin Ebbinghaus och Martin Bredinger från EY benar ut några av utmaningarna ur ett legalt, respektive ett strategiskt perspektiv. Begränsat antal platser. No-show faktureras med 300 kr. Gratis för medlemmar i Connect och partners. Övriga: 200 kr. Betalning via kort på plats eller faktura. Utbildningen ska ge omfatta grundläggande kunskaper i styrelsearbete kopplat till VD och styrelsens roll, ägarfrågan, rollfördelning, ABL och ansvar och innehålla områden som styrning, bemanning, inriktning och arbetssätt. 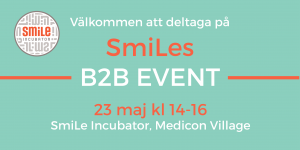 May 18th / training "Affärsmässighet"
Deadline for registration to 3D-printing events at Medicon Village on May 4th and May 5th. For more information and registration visit the event´s website How can Medtech companies use 3D printing technology?